Dave Morgan explains the many benefits of the National Gardens Scheme. Visiting gardens is good for you – it’s official! Well, perhaps not actually “official”, but ex-Government Minister Lord Howard, who is now chairman of the Help the Hospices charity, said at a recent National Gardens Scheme (NGS) meeting, “Visiting gardens is a wonderful and life enhancing experience”. Visiting gardens open under the NGS is becoming more and more popular for a variety of reasons. Firstly, it’s an inexpensive afternoon out; secondly, you get to see some wonderful gardens that are in private ownership, from small back gardens to large estates; and thirdly, you can pick up some great tips for your own garden, benefit from free expert advice, enjoy some delicious cakes and often pick up some plant bargains as well. And of course, some of the popularity is purely down to the fact that many of us, if we are honest, are just curious about what happens in our neighbours’ gardens! But if visiting gardens is good for us as visitors, it can also be good for those who are not able to visit due to health problems – because the NGS is not only about promoting excellent and interesting gardens but is also about raising money for healthcare charities. Indeed, in 2014, from an income in 2013 of about £3.5 million, the NGS will be giving away £2.5 million to these charities. Some of the major beneficiaries of the NGS include Marie Curie, Macmillan Nurses, Help the Hospices (which supports about 250 hospices around the country), and the Queens Nursing Institute, and over the past few years the NGS has donated over £25 million to these four alone. The NGS is the largest annual donor to most of its regular beneficiaries. But that still isn’t all! 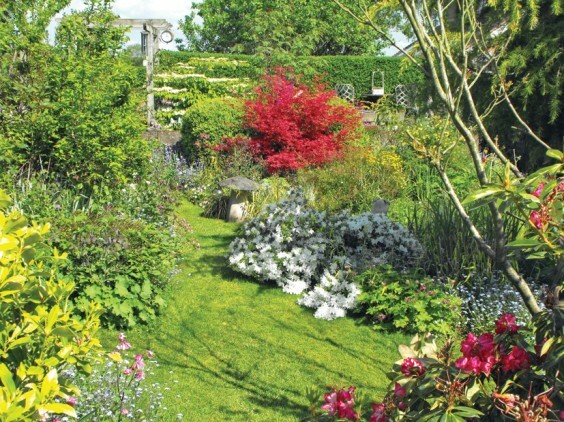 There is a guest charity, currently Parkinsons, that will receive over £100,000 – and local garden owners can elect to donate monies raised through refreshments or plant sales to a local charity of their choice. So visiting an NGS garden can really benefit you as an individual, and give you a wonderful day out, can benefit those who need special care through their illnesses and can also benefit the local community. Now that IS value for money! So – where should you go? Well, to plan your visits and take advantage of more than 100 special open days in Worcestershire alone, or to arrange a private visit to a garden in the county that accepts visits “by appointment”, get hold of either the Worcestershire NGS leaflet, obtainable from most libraries, tourist information centres and garden centres, or buy the full country-wide “Yellow Book”. The first garden open in our part of the county is our own garden, at Oak Tree House, Birmingham Road, Marlbrook (opposite the Hilton Hotel). This will be our first year opening “solo” – we were one of three “Marlbrook Gardens” for the past eight years but one of the other garden owners wants a year (or more) off so we are on our own this time. If I’m honest, Mrs Morgan is the real gardener and she comes from a gardening family, as her grandfather was head gardener at Westwood House in Droitwich in the days of Lord Doverdale, and her father, the late Jack Collis from Barnt Green, also worked on that estate and several others in his day. And me? I just do what I’m told! Ours is a true plantsman’s garden – you will struggle to find much bare earth as every spare foot of soil is planted up. Spring is usually the best time to visit as, depending on weather, there could be a riot of colours from azaleas, rhododendrons, late-flowering tulips, a 30-year old tree peony and many other plants. We will be open from 11am to 5pm on Sunday May 25, admission £3 (children free) – there will even be a small exhibition of paintings in the conservatory. So why not treat yourself this year – get into some wonderful Worcestershire gardens, enjoy the creativity and horticulture, the friendliness of the owners and their wonderful refreshments, pick up a plant bargain or two – and help others who are less fortunate at the same time.